Did Sprint Just Launch 4G In The Bay Area? Skatter Tech’s lead content editor Alex Harvey-Gurr was comparing her Droid X with her friend Jonathan Hong’s EVO 4G today when they noticed something odd. While facing weak 3G signal during lunch in Walnut Creek, Hong choose to switch on the 4G option and was surprised when it suddenly found a signal. That’s a real shocker, since Sprint hasn’t yet officially announced the launch of the San Francisco 4G network although their PR team did indicated that the switch might be turned on before Ocotber. To show us some proof, Hong managed to snap a screen shot of his phone connected to Sprint’s 4G network and run a few tests with the SpeedTest.net app from the Android Marketplace. At roughly 2 PM yesterday, he was able to secure 2-3 bars of 4G signal at Original Mel’s Diner in Walnut Creek, which is just 30 minutes away from San Francisco. To ensure that it wasn’t erroneous, he kept checking signal strength as he made his way across Walnut Creek over the next several hours. To his surprise, 4G was everywhere in the city. Naturally, as a tech enthusiast, he ran several speed tests from various parts of the city. Download speeds peaked at nearly 3,000 kbps, but averages were only around 2,000 kbps when connecting to the Los Angeles SpeedTest.net server. As for Upload speeds, it reached the Sprint-set cap of 1,000 kbps just about every time. Latency times averaged at 126 ms as well, but it might have been even less if he choose the closer San Francisco SpeedTest.net server. The numbers are great, especially considering that Sprint’s 4G infrastructure probably isn’t fully ready. According to Hong, the 4G speeds were nearly 3 times faster than the 3G speeds in the same areas. The introduction of 4G will be great for customers, since those in 4G areas can simultaneously place voice calls and access data, not to mention faster speeds with the Mobile Hotspot feature. While AT&T and Verizon Wireless cap monthly data usage, Sprint offers a truly unlimited plan. According to Twitter, there have been reported sightings on 4G working across the Bay Area. Mentioned areas include: Mountain View, Palo Alto, Santa Clara, San Jose, and nearby areas. Until we get word straight from Sprint, Skatter Tech needs your help. If you own a 4G device, whether it’s an Overdrive or a HTC EVO, turn it on and see if you can connect to a 4G network if you live in the San Francisco Bay Area. Report your findings to us by replying in the comments with the date/time, location, and upload/download speeds. 7/8/2010 – 4G signal in Sunnyvale, CA – Mary and Maude to be exact. Averaging 2mbps down, with a high of 3mbps. As I drove up 17->880->Mission->680N I got 4G as I left Campbell, by Stevens Creek (Vally Fair), by Milpitas, and Fremont. I also got the strongest 4G signal as I made my way through Walnut Creek. It’s pretty damn fast. I had someone in the car run a speed test while driving, it hit 2.5MB/s down and 1MB/s up. Got 4G in San bruno but not able to connect. Tanforan shopping center. Nothing in San Rafael 7/15/10. Will check in SF Marina district tonight. Mountain view, near google campus. Sunnyvale Mathilda & 101, Santa Clara near 101, Cupertino and Downtown San Jose. Tried out the 4G option on my HTC EVO this morning and it works! Lightning faster than the 3G. Central downtown Fremont area a few blocks from the Hub shopping center. 3.3MB/s down and .83 MB/s up downtown Fremont. Well, since last week, the weak 4G signal has become weaker, and I cannot get an IP. I hope they did not re-direct the previously weak signal (but able to connect to 4G) elsewhere for good. I’ve been in oakland ca. Plenty of times an have 4g connection my wife too…I haven’t did any speed test or download text but my phone did run a lot faster…I went on the web to see if anything would work faster an it did no waiting everything downloaded pretty fast. 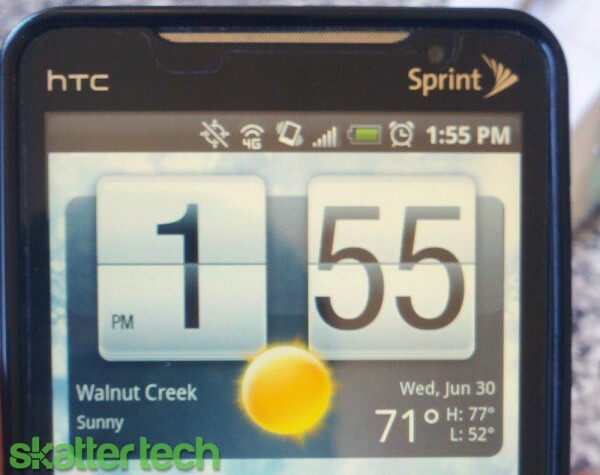 An it did last all the way through walnut creek…htc evo 4g …..but still waiting for fairfield ca …..